China's Sinopec began commercial operation of a new 1.2 million mt/year (24,100barrels/day) catalytic reforming unit August 20 at its 13.5 million mt/year Maoming refining and chemical complex, a MRCC official said Wednesday. The Maoming complex is in southern China's Guangdong province. With total investment of Yuan 590 million ($73.75 million), the unit will increase MRCC's total gasoline output by around 180,000 mt/year to 1.86 million mt/year, the official said. Output growth would mainly comprise 93 RON and 97 RON material. Oil products from Maoming are mainly supplied to the south China market. The unit's contractor, Maoming Southwestern Petrochemical Engineering Co., began building the CRU around June 2005 and completed it in July 2006. However, as soaring international oil prices and China's government-controlled oil product prices continue to weigh on the margins of China's refiners, refiners are reluctant to increase runs. Instead, many are maintaining output levels at just high enough to meet their term commitments, industry sources said. MRCC expects to post a loss from refining of around Yuan 400 million in August, Yuan 140 million higher from July's Yuan 260 million loss, according to the official. On August 13 MRCC also began operating a new 2.6 million mt/year gasoil hydrotreater dedicated to producing Euro II and Euro III gasoil. The company produces around five million mt/year of gasoil. China switched to 500 parts per million sulfur (0.05%) gasoil from 800ppm to comply with Euro II emission standards throughout the country starting July 1, 2005. The country also plans to adopt Euro III standards, which limit sulfur in gasoil to 150 ppm, in 2010. Univation Technologies announced that China Petroleum &Chemical Corporation (SINOPEC CORP) has selected the UNIPOL PE process for a 450 kilo-tonnes-per-year polyethylene plant at its affiliate, Sinopec Zhenhai Refining and Chemical Company Ltd., in Ningbo, People's Republic of China. The new facility, scheduled for start-up in 2009, will be capable of producing a full range of linear low and high-density polyethylenes. The proven capability and reliability of the UNIPOL PE process to manufacture a broad range of polyethylenes at high throughput with low capital investment per tonne of capacity was a key consideration in the selection, sources said. "By selecting the UNIPOL PE process, SINOPEC continues to position itself for success in China's rapidly growing polyethylene market," said Kenneth Glover, Univation's President and CEO. "The proven flexibility of UNIPOL PE with its conventional and metallocene catalyst coupled with our continuing research and development advancements, provides our customers with the opportunity to meet the ever changing market needs over the long haul." SINOPEC is one of China's largest petroleum and petrochemical companies. SINOPEC operates eight UNIPOL PE reactor lines, with two more currently under design. Univation Technologies, LLC is the world leader in licensing gas phase polyethylene technology. Univation has comprehensive technology programs focused on the UNIPOL(TM) PE gas-phase process, conventional catalysts (UCAT(TM) Catalysts), and metallocene catalysts (XCAT(TM) Catalysts and PRODIGY(TM) Catalysts). Univation is a 50/50 JV between ExxonMobil Chemical Company and The Dow Chemical Company. Univation was originally formed in 1997 as a JV between Exxon Chemical Company and Union Carbide to license the UNIPOL PE Process, metallocene catalyst technology, and to sell metallocene catalysts. China's Sinopec Yizheng is now awaiting headquarters' approval prior to commissioning its newest 900,000 mt/year purified terephthalic acid plant in Yizheng City of east China's Jiangsu Province, a company source said Wednesday. The PTA plant received approval by the Country's National Development and Reform Commission in 2004, but construction works have been delayed by Sinopec specifications that require at least 70% of the plant components to be domestically produced. "We're struggling hard to accomplish this, and hope to begin production by the end of 2006," the company source noted. Sinopec Yizheng currently operates two PTA lines with combined capacity of 930,000 mt/year, the source said. China's Jiangsu Sopo 江蘇索普is in the process of modifying the process technology of its acetic acid plant in Zhenjiang 鎮江, Jiangsu which would enable it to use synthetic gas feedstock derived from coal, instead of methanol and carbon monoxide, a company source said. The project is slated for completion in the first-half of 2009, and would raise Sopo's AA capacity from 500,000 mt/year to 600,000 mt/year. The firm's synthetic gas output would also be used as feedstock for a 400,000 mt/year methanol plant which is under construction and slated for completion in H1 2009 too. When on stream, most of its output will be for the firm's captive use towards the acetic acid plant. Sopo has further plans to expand it acetic acid and methanol capacities to 800,000 mt/year and 500,000 mt/year respectively by 2010. Other methanol plants in the Asia Pacific region, such as those operated by PT Medco in Indonesia, Petronas in Malaysia and Methanex in New Zealand, are based on natural gas. But Chinese producers tend to favor coal due to the country's ample supply of coal. Shanghai Coking has a coal-based methanol plant in Wujin which has the capacity to produce 350,000 mt/year. The Group's principal activities are the manufacture and sale of chemical materials and products. Products include ADC blowing agent, NA0H, calcium hypochlorite and hydrogen chloric acid. Other activities include generation and distribution of steam heat and electric power. Operations are carried out in the People's Republic of China. China's Zhejiang Yisheng Petrochemical will start up its second purified terephthalic acid (PTA) plant in the second-half of November 2006, a company source said Monday. The plant, located in Ningbo, China will have a production capacity of 650,000 mt/year of PTA. It is located near Zhejiang Yisheng's existing PTA plant, which following a debottlenecking earlier this year, has a production capacity of 660,000 mt/year of PTA. Zhejiang Yisheng currently uses all of its own PTA. But with the additional capacity from the new plant, it will be able to offer about 400,000 mt/year of PTA to be sold--mostly to existing contract buyers first, and then to the spot market. The start-up of the second plant had been delayed from November 6 to the second-half of November due to a shortage of paraxylene feedstock. Regional paraxylene supply has been tight this year due to several unplanned plant outages. The arbitrage window from the US to Asia, which has typically provided Asia's thirsty PTA plants some relief through alternative supply, remained firmly shut this year before prising open again in late August. Asia's paraxylene shortage was heard to have delayed the start-up of several new PTA plants in the region, all of which were supposed to have been online already. Those heard delayed because of a shortage of paraxylene feedstocks include China's Zhejiang Hualian Sunshine Petrochemical in Shaoxing City, Zhejiang Province No 2 plant, expected to produce 600,000mt/year of PTA. Both Zhejiang Yisheng and Zhejiang Hualian Sunshine have been heard buying spot cargoes for October and November cargoes in recent weeks. The situation appears to be changing, however. Spot PX prices buckled under the weight of bearish crude prices and a collapsing PTA spot market in the week ending September 15. Platts assessed PX spot prices $98/mt lower on the week, at $1,351-1,353/mt FOB Korea for cargoes loading in October and at $1,371-1,373/mt CFR Taiwan for cargoes delivered October 5-25. Weekly spot PTA prices were pegged at $998-1,002/mt CFR Northeast Asia on September 14. China's Shanghai Gaoqiao completed construction of its 200,000 mt/year acronitrile-butadiene-styrene plant on Wednesday, a source close to the company said Thursday. The company expects to begin commercial ABS output from the new facility by the end of 2006, the source added. Construction of the plant began in mid-April. The plant expects to obtain 12,000-13,000 mt/month of its styrene feedstock from Shanghai Secco Petrochemical's neighboring 500,000 mt/year styrene plant. While most of the ABS product from the new plant is expected to be sold in the China domestic market, some could be exported to Japan or other countries depending on market demand. Meanwhile, the company began operations at a separate 100,000 mt/year styrene butadiene rubber unit ( in Gaoqiao 誤り) in early September, and has already begun producing on-spec material for sale in the spot market, the source said. The SBR output from that facility is also expected to be sold mainly in the Chinese domestic market. China's Sinopec Yangzi Petrochemical Company's plans to start up a new 450,000 mt/year purified terephthalic acid unit in Nanjing on November 20, 2006, a company source said Thursday. "Right now, we are making preparations for trial production," the source added. Once brought online, the new plant will boost the company's total PTA production capacity to 1.15 million mt/year. The company operates two other PTA plants with a combined capacity of 700,000 mt/year. "We expect to run our PTA plants at full rates and believe that our actual production will exceed the nameplate capacities," the source said. All paraxylene feedstock for the plant will come from the company's PX unit, which was expanded to its 800,000 mt/year capacity in the first half of 2006. Yangzi's PTA output is all sold domestically. The project construction work is expected to take about two and a half years and the first output from the new plant scheduled for the end of 2009, according to another company source. One major hurdle yet to be overcome is finding a source of coal feedstock for the facility, a source close to the company said. This project will be managed by a newly founded joint venture that is expected to start operation in the first quarter of 2007. The biggest shareholder, Sino Biopharmaceutical Ltd, holds a 43% stake through its subsidiary Chia Tai Refined Chemical Industry Ltd. Sino Biopharmaceutical is listed on the Hong Kong Exchange and the company obtained approval for the project during a shareholders' meeting held October 12. Both plants will be located on the Dagushan peninsula of Dalian city in northeast China's Liaoning Province. The 450,000 mt/year PX plant would cost a total investment of Yuan 4.5 billion ($571 million). Construction work at the plant, which will be jointly owned by Dahua and Dalian Fujia Corporation Group 大連福佳企業集団, began in October. Once complete, the plant would also be capable of producing 200,000mt of benzene and 100,000 mt of orthoxylene yearly, in addition to PX. The 500,000 mt/year QTA plant is a joint venture between Dahua and the Zhejiang Yisheng Petrochemical Co Ltd 浙江逸盛化学, which holds a 75% stake in the project.Total investment cost is estimated at Yuan 1.98 billion ($251 million). "The design contract has just been signed and we plan to start construction in the first half of 2007," said another source from Dahua. Zhejiang Yisheng, which is a key PTA producer in China, is jointly owned by polyester producers Hengyi and Rongshen. In related news, Dahua Group has another 300,000 mt/year coal-based methanol plant currently under construction at the same complex in Dalian. The project began in May 2005 and output is expected to start by September 2007. China's Xinjiang Petroleum Administrative Bureau completed test runs at its new 200,000 mt/year methanol plant in Xinjiang, a company source said on Friday. The test runs at the natural-gas fed plant started in the middle of October. During the test runs, the company found some problems which need to be repaired, the source noted. The company was targeting to start-up early spring--which would be around March or April, the source said. Methanol output from the plant will be mainly supplied to consumers within the Xinjiang Uygur Autonomous Region. "The logistic costs will be too high to sell it outside the region," the source noted. China's Jiangsu Shuangliang Lishide Co expects to double styrene monomer production at its plant in East China's Jiangyin City of Jiangsu Province in 2008, a company source said on Monday. The company first started production at the 200,000 mt/year plant in mid-2006. "Actually we have already been doing some preliminary work, but the company still needs to obtain approval from various government bodies, such as the environmental agency, before we can go ahead with the expansion," the source said. "We expect to expand production in 400,000 mt/year in 2008 if things go smoothly." In related news, China's Jinzhou Petrochemical Company was scheduled to start up its 80,000 mt/year SM plant in Northeast China's Liaoning Province in early December 2006, and China's Sinopec Hainan Petrochemical also completed construction at a 80,000 mt/year SM plant in South China's Hainan Province in September. "Shuangliang's expansion will more length to the China domestic SM market, and import quantities may eventually fall," one major local distributor said. The Iranian government and China's biggest offshore oil producer, CNOOC Ltd., have signed a $16-billion natural gas deal, Iranian news agency Mehr reported Wednesday. Mehr, citing Chinese news agency Xinhua, said the deal would cover the development of Iran's northern Pars gas field and the construction of liquefied natural gas facilities which will export gas to China. An Iranian Oil Ministry official told Dow Jones Newswires he believed the deal was a memorandum of understanding but had no additional details. However, an Iranian oil official told Dow Jones Newswires that the agreement is a concrete deal. The announcement comes amid an aggressive push by China to tap Iran's giant natural gas reserves, the second biggest in the world after Russia, to fuel power plants and other industrial projects. North Pars is Iran's second biggest gas project after the far bigger South Pars offshore field. The agreement between Iran and CNOOC comes after the Islamic nation signed a $100 billion, 25-year contract with China's Sinopec for the production and export of LNG in late-2004. That deal envisions potential LNG exports of 1.3 billion cubic a day and the development of Iran's Yadavaran oilfield. Iran has been a net gas importer due to lagging investment caused by U.S. sanctions that has slowed development of its gas resources. The country is expected to become a net exporter by 2010, according to the International Energy Agency. However, one Iranian analyst based in London said: "This announcement is highly political as it follows the anti-Iranian sentiment by the U.K. government towards Iran in recent days." He said the Iranian government wants to show the world that despite western pressure on countries not to invest in Iran, some companies are still prepared to work with the Islamic republic. Tuesday, U.K. Prime Minister Tony Blair described Iran as a "strategic threat" within the Middle East. While the joint investment may end the tussle for separate refinery deals for now, PetroChina and Sinopec's collaboration won't be all roses, in view of possible profit-sharing and product distribution issues. "A major reason to give PetroChina the lion's share is that it secures the crude source," said the official. Otherwise, Sinopec would have to buy crude from the international spot market, which means greater exposure to fluctuating global oil prices. China's southwest, comprising the provinces of Sichuan, Yunnan, Guizhou, the municipality of Chongqing, and Guangxi region, is in great need of more refinery capacity. "The market in the southwest is potentially huge, but is short of refining capacity," said a Sinopec official Friday. Demand for oil products exceeds 16 million tons on average each year. Over the last few years, a supply shortage has emerged due to a shortfall in nearby Guangdong province, which on its own consumes 20 million tons of oil products annually. UOP LLC, a Honeywell company, announced today that PetroChina Company Ltd., a subsidiary of the China National Petroleum Corp. (CNPC), has selected UOP to supply technology, basic engineering services and equipment for an aromatics project to be installed at PetroChina’s Urumqi facility. Basic engineering design is underway, and commissioning of the complex, located in China’s Xinjiang Uygur Autonomous Region, is scheduled for early 2009. CNPC is China’s largest producer and supplier of oil and natural gas and is a major producer of refined oil products and petrochemicals. In addition to the Parex unit, the complex will be comprised of other process units designed by UOP, including a CCR Platforming - unit to convert naphtha, an oil-derived feedstock, to aromatics and hydrogen and an Isomar - unit to convert other xylenes to para-xylene. This will be the second aromatics complex UOP has designed for PetroChina’s subsidiary, the Urumqi Petrochemical Co., Ltd. (UPC). UPC started up the first aromatics complex in western China in 1995, which contained units using the Parex, Isomar, and TatorayTM processes designed and licensed by UOP. Globally, UOP has licensed more than 725 individual process units for the production of aromatics. CNPC was ranked 9th among the world’s top 50 petroleum companies by U.S. Petroleum intelligence Weekly in 2005, based on indices of oil and gas reserves, production, crude processing capacity, and sales of refined oil products and reported over 690 billion Yuan ($86.3 billion) in sales in 2005. PetroChina is CNPC’s largest subsidiary and is responsible for its domestic operations in the areas of oil and gas exploration and development, oil refining and petrochemical production, marketing, pipeline transportation, and natural gas sales and utilization. For more information, go to www.cnpc.com.cn. UOP LLC, headquartered in Des Plaines, Illinois, USA, is a leading international supplier and licensor of process technology, catalysts, adsorbents, process plants, and consulting services to the petroleum refining, petrochemical, and gas processing industries. UOP is a wholly?owned subsidiary of Honeywell International, Inc. and is part of Honeywell’s Specialty Materials strategic business group. For more information, go to www.uop.com. Honeywell International is a $31 billion diversified technology and manufacturing leader, serving customers worldwide with aerospace products and services; control technologies for buildings, homes and industry; automotive products; turbochargers; and specialty materials. Based in Morris Township, N.J., Honeywell’s shares are traded on the New York, London, Chicago and Pacific Stock Exchanges. It is one of the 30 stocks that make up the Dow Jones Industrial Average and is also a component of the Standard & Poor’s 500 Index. For additional information, please visit www.honeywell.com. Singapore-incorporated SunVic Chemical expects to start construction work soon for the expansion of its acrylic acid and acrylate ester plants at Xiangshui 響水 in China's Jiangsu province, it said in a statement. The project is scheduled for completion in the fourth quarter of 2007, and would boost its AA and AE nameplate capacities by 55,000 mt/year and 40,000 mt/year respectively to 205,000 mt/year and 250,000 mt/year. Last year, SunVic's main suppliers of propylene feedstock were Sumsung Corp, Shougang Shanshou Chemical Co, Wuxi Petroleum Chemical Engineering Factory, and China Petroleum and Chemical Corporative Shengli Oilfield Co. The company is in the process of building a 3,000mt liquid cargo jetty at Xiangshui which is scheduled to be completed in the first half of 2007. The facility would enable the company to save on transportation costs, it said. SunVic was listed on the main board of the Stock Exchange of Singapore from February 5, 2007. Last month the firm said it used S$10.15 million ($6.65 million) of the proceeds from its IPO to repay existing bank loans which it had taken up for working capital. SunVic posted a net profit of Yuan 93.3 million ($12.05 million) for 2006, a decrease of 46.7% from Yuan 175.18 million for 2005. It linked its earnings decline to lower AA and AE prices and a significant increase in the cost of propylene feedstock. ・ the balance of approximately S$6.4 million for general working capital requirements. Strategically located in the Chenjiagang Chemical Zone of Yancheng 塩城 city in Jiangsu Province, SunVic Chemical currently has an annual production capacity of approximately 150,000 tonnes of AA and 210,000 tonnes of AE, which are sold to customers in the PRC as well as the overseas market. In comparison, the total production capacity of AA and AE in the PRC in 2006 is estimated at approximately 828,000 tonnes and 921,000 tonnes respectively, according to Chemical Market Associates Pte Ltd (“CMAI”), an independent consulting firm that provides advice to the petrochemical industry. Jiangsu Province also forms part of the eastern region of the PRC, which according to CMAI, had experienced the highest growth in demand for AA and AE in the last five years. In 2005, AA and AE demand in the eastern region of the PRC accounted for approximately 64.7% and 49.5% of AA and AE demand in the PRC respectively. China's Sinopec Shanghai Petrochemical Co (SPC) has begun trial runs at its new monoethylene glycol plant in the Jinshan district of Shanghai, a company source said Wednesday. The company has been conducting trial runs at the new 380,000 mt/year plant since March 3, and the plant was reported to be running smoothly as of Wednesday although it was still unclear when the unit would be able to start on-spec MEG production, the source said. Once operational, approximately 40,000 mt/year from the new plant is scheduled to be sold to the spot market with the remainder allocated to SPC contract customers. As a result, an additional 3,000mt of MEG should be available for sale in the spot market each month, according Platts' earlier report. Meanwhile, SPC's older 230,000 mt/year MEG plant remains shut down as it undergoes a maintenance turnaround that began February 10. The turnaround is expected to last for 45 days, the source said. Aker Kvaerner has been awarded a contract with China Petroleum Material & Equipment (Group) Corporation (a subsidiary of China National Petroleum Corporation 中国石油天然ガス総公司 ) for the basic engineering design and supply of certain equipment for a new Polypropylene plant at the PetroChina GuangXi Petrochemical Company complex in GuangXi Province広西チワン自治区, People's Republic of China. The contract value to Aker Kvaerner was not disclosed. Aker Kvaerner is providing the basic engineering design, together with certain offshore equipment, from its offices in the Netherlands. GuangXi is an integrated refinery complex with downstream facilities for the production of a wide range of products. The new Polypropylene plant will have a capacity of 200,000 metric tons per annum (tpa). Plant start-up is expected in 2008. The project will utilise The Dow Chemical Company's UNIPOL(TM) polypropylene technology, one of the core technologies in the Aker Kvaerner process portfolio. This additional Polyolefins project places Aker Kvaerner amongst the world leading contractors in this field. Wim van der Zande, President of AK Process, said, "We are delighted to be working on this new project for PetroChina, a key client for Aker Kvaerner and one of the largest producers of petrochemical products in China. "We're already involved with their new full density Polyethylene plant at the Dushanzi 独山子complex in Xinjiang province. Given our in-depth experience across a large proportion of the UNIPOL(TM) PP lines around the world, coupled with our considerable local knowledge of working in the Chinese market, we are well placed to execute this project to a high quality and on schedule," he added. The success of the Dow UNIPOL(TM) PP process, which involves production of polypropylene in a low pressure gas phase reactor, places Dow among the world leaders in polypropylene technology. The total number of UNIPOL(TM) PP lines either installed or under construction around the world is now over 40. Of these, 8 have been designed and/ or built by Aker Kvaerner, making the company one of the most experienced UNIPOL(TM) PP contractors in the industry. Dow Technology Licensing, a business group of The Dow Chemical Company and its consolidated affiliates (Dow), today announced that its world-leading UNIPOL™ PP Process Technology has been selected for a new 200 KTA polypropylene (PP) facility to be constructed at the PetroChina GuangXi Petrochemical Company complex in GuangXi Province, The People’s Republic of China. The PetroChina GuangXi plant will be the second in China to utilize the UNIPOL PP Process Technology. Consistent with its drive to provide licensees with comprehensive and top quality services to aid in project execution, Dow is collaborating on this project with Aker Kvaerner, a leading global provider of engineering and construction services that has designed and/or built numerous UNIPOL PP lines around the world. Aker Kvaerner will provide the basic engineering design and certain offshore equipment for the new plant, which is expected to come on line in 2008. The process design package provided by Dow has been delivered, and Aker Kvaerner is in the final stages of delivering the basic engineering design. There are more than 40 UNIPOLPP production lines that are either being constructed or are fully operational around the world. These lines account for more than 6,500 KTA of global polypropylene production. Aker Kvaerner has signed a contract with PetroChina International Company Ltd., for the basic engineering design and supply of certain equipment for a new full density Polyethylene plant at the Dushanzi complex in Xinjiang province, People's Republic of China. Aker Kvaerner will provide the basic engineering design, together with offshore equipment and material supply, from its offices in the Netherlands and China. Dushanzi is an integrated ethylene cracking complex with downstream facilities for the production of a wide range of polymer products. The new full density polyethylene (FDPE) plant consists of two lines each with a capacity of 300,000 tonnes per annum (tpa). The project, to be executed on a fast-track basis, will commence this month. Plant start-up is expected in September 2008. The FDPE plant will make use of Univation's UNIPOL(TM) polyethylene technology, one of the core technologies in the Aker Kvaerner process portfolio. "This is the fourth polyolefin project to be awarded to Aker Kvaerner this year," says Wim van der Zande, president of AK Process, Aker Kvaerner's European Process business. "We are very pleased to be involved in this project. Our selection reflects the strong track record we possess in working with this leading edge technology, together with the vast experience we have accumulated on projects throughout China. Given the challenges associated with transportation and winter weather conditions, our project execution methodology will be a decisive factor in helping us to play our part in achieving this fast track schedule." The success of the UNIPOL(TM) PE process, which involves production of polyethylene in a low pressure gas phase reactor, places Univation among the world leaders in polyethylene technology. The total number of UNIPOL(TM) PE lines either installed or under construction around the world is now approaching 100. Of these, 18 have been designed and/ or built by Aker Kvaerner, making the company one of the most experienced UNIPOL(TM) PE contractors in the industry. The State-owned Assets Supervision and Administration Commission (SASAC) has selected China Resources Enterprise (CRE) to act as a strategic investor for the troubled state-owned pharmaceutical company 999 Group. Sources with the SASAC said on Monday that it had picked CRE to rescue the debt-laden drug maker in order to protect the interests of the group's minority share-holders and ensure the healthy development of the company. The Shenzhen-based drug company is engaged in a wide range of business, including pharmaceutical production and packaging, medicine sales and the provision of medical services. The group, however, slipped into a grave credit crisis in 2003 and the SASAC approved the financial restructuring of the company in 2004. The SASAC picked CRE from five conglomerates that applied to be strategic investors at the end of 2006, including Deutsche Bank and the Fosun Group. China Resources is dedicated to enhancing people’s lives by bringing them fundamental goods and services. Its name symbolizes “the great land of China, endowed with abundant natural resources”. China Resources began its history in Hong Kong in 1938 as Liow & Company. It was renamed China Resources Company in 1948 and restructured and incorporated under China Resources (Holdings) Co., Ltd. in 1983. In the same year, it relocated to its current headquarters in the China Resources Building on 26 Harbour Road, Wanchai. In over half a century’s business in Hong Kong, China Resources has established a strong reputation based on its proactive business strategies, an open corporate culture and a commitment to fostering a better future. Today, it is one of the leading conglomerates in Hong Kong and the Chinese Mainland, with assets totalling around HK$100 billion. China Resources’businesses touch every facet of people’s lives. Its core businesses cover three fields: the manufacture and distribution of daily consumer goods, properties and related industries, plus infrastructure and public utilities. Moving forward, the company will further develop its core businesses in the Chinese Mainland, striving to become the market leader in each industry. The success of its core businesses will stimulate the further growth of the entire company and create a broader development space. China Petroleum & Chemical Corp., better known as Sinopec, is in talks with foreign companies for joint investment in its planned $1.9-billion ethylene facility in Wuhan city, central China, a senior Sinopec official said Thursday. SK Corp., South Korea's largest refiner by capacity, and Formosa Plastics Group, Taiwan's leading petrochemical producer, are among the foreign companies in talks with Sinopec for the first large-scale petrochemical complex in central China, according to people in the industry. "We are in talks with foreign companies for joint investment in the ethylene project, but talks haven't concluded. We'll announce the results when we finish the talks," the Sinopec official told Dow Jones Newswires, but declined to be identified. Sinopec, China's largest refiner by capacity, recently won a government approval to build the ethylene complex to ease a petrochemical shortage in central China. Because of a lack of investment, it hasn't been decided when construction of the complex will begin, said another official from Sinopec's subsidiary in Wuhan city, Hubei province. "Sinopec doesn't have sufficient capital for the large project, since it has invested heavily in other ethylene plants, such as in Tianjin and Zhenhai," he said. Investment in the planned ethylene complex will likely be a good opportunity for foreign companies to tap China's petrochemicals market, which is booming due to strong domestic demand. "SK is currently reviewing a JV project with Sinopec to construct a naphtha cracking center in Wuhan, China. However, nothing has yet been finalized," said an official with SK, who declined to be identified. Formosa Group has also considered possible investments in Sinopec's Wuhan ethylene plant, but the case is still "very very preliminary," said an official with Formosa, who also declined to be identified. The ethylene plant is designed to produce 800,000 metric tons of ethylene each year, with feedstock from Sinopec's nearby Wuhan refinery. China's total ethylene production was expected to hit 16 million mt/year in 2010, compared with just over the 10 million mt projected for 2007, said Qin Wei Zhong, Director, Planning and Development at Sinopec, Thursday, at the seventh Asia/China Chlor-Vinyls conference. Qin said China's ethylene consumption would likely increase to 25 million mt/year in 2010 compared with 20 million mt/year in 2007. Due to the planned cracker expansion in China, ethylene imports to China would likely be unchanged. He said a cracker project in Fujian, which has been conducted by Sinopec, ExxonMobil as well as Saudi Aramco, would be completed in late 2008. The cracker was scheduled to start early 2009 and was expected to produce 800,000 mt/year of ethylene. In Tianjin, Sinopec was scheduled to start up a cracker with one million mt/year ethylene capacity in the first-half of 2009. Qin said China's naphtha imports would not increase significantly because of the series of cracker expansions as most of these plans come with refinery upgrades. Asked about an impact on such cracker projects from MTO (methanol-to-olefins) process, Qin said he was not too concerned about it. "There are several difficulties for MTO process as it needs large coal supplies and sufficient water supplies," he said. Qin said Sinopec itself has been developing a MTO process technology as well. The conference, organized by the Center for Management Technology, was kicked off Thursday in Shanghai, China and was scheduled to end Friday. UOP LLC, a Honeywell company, announced today that Sinopec Shanghai Petrochemical Co., Ltd., a subsidiary of the China Petroleum and Chemical Corp., has selected UOP to supply technology, basic engineering services and equipment for an aromatics project to be installed at their Shanghai facility. Engineering design is currently in progress with commissioning of the complex scheduled prior to the end of 2008. The new plant, located in Shanghai, China, will produce 600 thousand metric tons per annum of para-xylene using UOP’s ParexTM process. Para-xylene is a key ingredient in the production of PTA (purified terephthalic acid), which is used to make polyester for fabric and PET (polyethylene terephthalate) chips for carbonated soft drink and water bottles. The new plant will also produce 280 thousand metric tons per annum of benzene, also a building block in plastics production. The demand for para-xylene in China is expected to grow at an annual rate of 14 percent over the next 10 years driven largely by the downstream market. In addition to the Parex unit, the complex will also include a CCR PlatformingTM unit to convert naphtha, an oil-derived feedstock, to aromatics and hydrogen and an Isomar? unit to convert other xylenes to para-xylene. Sinopec Shanghai Petrochemical Co., Ltd. (SPC) commissioned its first aromatics complex in 1986 operating units using UOP’s CCR PlatformingTM, SulfolaneTM, Parex, Isomar, and TatorayTM processes. Globally, UOP has licensed more than 725 individual process units for the production of aromatics. With more than 140 million tons of refining capacity, Sinopec is the largest producer and marketer of refined oil products in China and in Asia. It is also the largest distributor of petrochemicals in China and is the country’s second largest producer of oil and gas. China's Longyu Coal Chemical plans to launch a 500,000 mt/year coal-based methanol plant in Henan province by the end of this year, a company official said Thursday. The plant is expected to be expanded to a capacity of 1.6 million mt ultimately, he added. Using production technology from Shell, the plant is scheduled to come on stream in three stages. The first 500,000 mt/year stage, originally scheduled to be ready by August, has been postponed to the end of the year because of delays in some shipments. By 2009, the second stage is expected to be completed, adding another 500,000 mt/year of capacity. The completion date for the third and final stage is yet to be decided and it is expected to expand the plant's capacity to 1.6 million mt/year. This stage would also include a 500,000 mt/year propylene unit and a 300,000 mt/year polypropylene unit. But that would depend on the progress of the first two stages of the plant, the company said. Longyu Coal Chemical is a subsidiary of Henan-based Yongcheng Coal and Electricity Group, a major coal and electricity producer. Longyu Coal Chemical was formed in 2004 specifically for methanol and olefins production. Saudi Aramco will soon conclude an agreement with China Petroleum & Chemical Corp (Sinopec) to set up a refinery joint venture in Qingdao in eastern China's Shandong province, a Saudi Aramco official said. "The agreement on the Qingdao joint venture will be reached soon," Adil Al-Tubayyeb, vice president for joint venture development of Saudi Aramco's refining and international marketing division, told XFN-Asia on the sidelines of an industry forum. Earlier, Du Guosheng, assistant to the president of Sinopec Group, told state media that Sinopec, the country's largest refiner, is expected to sell a 25 pct stake in its Qingdao refinery to Saudi Aramco. Sinopec and the Qingdao municipal government have reached a preliminary agreement with Saudi Aramco over a stake sale, Du said. The Qingdao refinery, which involves phase one investment of 1.2 bln yuan, is due to enter commercial operations by the end of next year. It has annual crude processing capacity of 10 mln tons with the potential to generate revenue of over 30 bln yuan. In April, Sinopec Group and Saudi Aramco signed a memorandum of understanding under which the Saudi company committed to supply Sinopec and its affiliates 1 mln barrels per day of crude oil by 2010. The MOU also covers Saudi Aramco's two ongoing joint developments in China, the Fujian refining and ethylene project and the Qingdao refinery project. The Fujian integrated project, in which Saudi Aramco, Sinopec and ExxonMobil are equity partners, involves two joint ventures with a total investment of 5 bln usd to expand a Chinese petrochemical refinery and operate a chain of 750 fuel stations. The project is expected to enter operations in early 2009. China Petroleum & Chemical Corp (Sinopec) is expected to sell a 25 pct stake in an east China refinery to Saudi Aramco in a deal that analysts said will give the Saudi company a major boost in China's fast growing market. They also said the tie-up with Aramco at a refinery under construction in Qingdao will allow Sinopec to limit some supply-side risks posed by the OPEC production quota. "In terms of supply security for Sinopec, there is a big advantage there," said Argus Media oil analyst Jason Feer, adding that Saudi Arabia will give its own refining ventures priority in sales of crude oil. "They (Saudi Arabia) would reduce volumes to other listers and keep their own volume fairly steady because they would lose money by shutting off volume to themselves," he added. Last week the China Business newspaper reported that Sinopec has reached a preliminary agreement to sell a 25 pct stake in the refinery to Saudi Aramco. Terms of the deal were not given. The project is due to come onstream by the end of next year, according to previous media reports. China's demand for energy has been expanding at a rapid pace as it needs to fuel its fast growing economy. The Asian nation wants to line up stable sources of crude oil - and the oil-rich kingdom has been one of China's main suppliers. Meanwhile, Saudi Aramco has been looking to ensure its own position in the market and believes a stake in refineries is the preferred strategy. "The Saudi firm can enter into China's huge end-consumer market and get more profit than just selling oil itself," said Han Xiaoping, an energy consultant at Falcon Power. "On the Chinese side, Sinopec can diversify its crude source," Han added. According to OPEC, Saudi Arabia regained in August its title as China's top source of imported crude oil. Angola had occupied the position since February. The organization also said that Saudi Arabia supplied 17.5 pct of China's nearly three mln barrel per day crude oil imports in September. Iran, Angola and Russian trailed the kingdom with roughly 12 pct each. "I think one possible reason (to invest) is to find a guaranteed long-term outlet for their (Saudi Arabia's) crude oil in addition to possibly earning returns on a refinery investment," said Purvin and Gertz energy consultant Victor Shum in a telephone interview with XFN-Asia. In April of this year, Sinopec Group and Saudi Aramco signed a memorandum of understanding that committed the Saudi company to supplying Sinopec and its affiliates with one mln barrels per day of crude oil by 2010. The accord was signed while Chinese President Hu Jintao was visiting Saudi Arabia, underlining the strategic importance of the Saudi-Chinese energy relationship. "As part of investing in the refinery, they (Saudi Aramco) require the refinery to purchase Saudi crude and this way they can ensure that they will sell the crude to China," Shum said. He added that the refinery will most likely be designed to process heavy, sour crude. "That will most likely be the source of crude from Saudi Arabia, and I think it would help make refinery economics look better," he said. The Qingdao project is not Saudi Aramco's first refining venture in China. In 2001 the company agreed to jointly upgrade a refinery in southern China's Fujian province with Sinopec and ExxonMobil as partners in a project worth 3.5 bln usd. The Fujian project will also be capable of processing high-sulphur crude and is expected to come online at the end of 2008. In additon to a 160,000 barrel-per-day expansion to the Fujian refinery, the project also includes an ethylene steam cracker and a polyethylene unit. China's Datong Coal Mine Group has begun preparations to build a 600,000 mt/year methanol plant in Datong, Shanxi Province 山西省大同市, a source close to the project said last week. Construction would take three to four year, the source said. The project has been approved by the National Development and Reform Commission. Datong Coal Mine Group has already completed a special ceremony to mark the beginning of construction works, the source noted. After completion of the plant, Datong Coal Mine Group has tentative plans to double its capacity to 1.2 million mt, but it had not set a timetable yet. The project will source its gas feedstock from coal provided from within the Datong Coal Mine Group. The first phase of the project will use technology provided by Shell, the source said. Datong Coal Mine Group Co., Ltd, formally known as Datong Coal Mining Administration, was established in 1949. In July 2000, Datong Coal Mining Administration was reconstructed as Datong Coal Mine Group Co., Ltd. In December 2003, Shanxi Province Government reconstructed all the enterprises dealing with coal production and coal transportation in the north of Shanxi Province into a new Datong Coal Mine Group Co., Ltd. This forms an extra large enterprise across Datong, Shuozhou 朔州 and Xinzhou 忻州 city. The number of employees is 200,000. The annual production and transportation of coal in 2005 was about 100.27 million metric tons. Our group is striving to catch every chance to enhance the development and to build a new coal group in power coal-chemical resource and diversified industries in order to improve the international competitiveness. The strategically goal of Datong Coal Mine Group Co., Ltd. is to produce and transport above 150 million metric tons of coal, generate electricity of 3,000MW, and produce 1.2 million metric tons of aluminum oxide, and 600,000 metric tons of methanol. If you are interested in any of our products, please feel free to contact us for more information. We are looking forward to forming business relations with customers from all over the world. Synthesis Energy Systems Investments, Inc, a subsidiary of Synthesis Energy Systems, Inc. (“SES” or the “Company”) , a coal gasification company involved in the conversion of low cost fuels into clean energy and chemical products, and Inner Mongolia Golden Concord (Xilinhot) Energy Co., Ltd., a subsidiary of Golden Concord Holdings Ltd. (“Golden Concord”), a private provider of electricity, steam and chilling water in China, have signed a co-operative joint venture contract to build an integrated coal gasification plant and methanol and Dimethyl Ether (“DME”) production plant (the “Plant”). Located in the Inner Mongolia Autonomous Region of China, the Plant will optimize low value, abundant lignites from coal mines to meet the region's growing need for clean, affordable non-petroleum-based fuels and petrochemical feedstocks. SES and Golden Concord will own 51% and 49% respectively of the joint venture named SES-GCL (Inner Mongolia) Coal Chemical Company Ltd. (the “JV Company”), based at the Lignite Coal Chemical Industrial Base of Xilinguole Economic and Technology Development Zone in the Inner Mongolia Autonomous Region. “The establishment of this project will provide wider clean energy choices in the future by supplying high-quality methanol and DME products to Beijing and other cities in North East China,” said Mr. Zhang Wei, Chief Administration Officer for Golden Concord. The JV Company will develop, construct, own, operate, and manage the Plant, which will utilize the Company's licensed U-GASR technology to convert low-quality, high-ash lignite coals made available from Golden Concord's coal mine in Xilinguole 錫林郭勒, Inner Mongolia and other mines in the area into a clean gaseous mixture called synthesis gas (“syngas”). The Plant is expected to produce about 84,000 Normal cubic meters per hour of gross syngas. The syngas produced will then be used as a feedstock for the production of a 225,000 ton/year methanol plant. Methanol is a basic building block used in manufacturing for a wide variety of chemical products including plastics, paints, construction materials, as a hydrogen carrier for fuel cell applications, and can be blended with gasoline. In this application, the coal-derived methanol will also be used to produce 150,000 ton/year of DME, an alternative to liquefied petroleum gas, liquid natural gas, diesel and gasoline. Coal is the most abundant energy resource in both China and the U.S. - together making up approximately 40% of world coal reserves. Producing clean energy and transportation fuels from indigenous coal sources is critical to both China and the U.S. Once an exporter, China now imports at least 43% of its oil supply, most of which is needed to supply its rising transportation fuel demands. According to the National Statistics Bureau, the number of private cars in China nearly tripled between 2000 and 2005, from 6.25 million to 17 million vehicles. DME, manufactured from methanol is a clean multi-purpose fuel, and is also becoming accepted as a synthetic liquefied petroleum gas blendstock in China. Using coal-derived methanol to produce DME, and other clean fuels, can help meet the world's need for non-petroleum-based fuels and petrochemical feedstocks. Both SES and Golden Concord have begun discussing future plans for expanding the syngas-methanol-DME Plant to further capture economic opportunities. Synthesis Energy Systems, Inc. is an energy and technology company that deploys proprietary systems and technology to gasify low value fuels to replace high cost energy and chemical products sold to major global markets. The U-GASR technology, which the Company licenses from the Gas Technology Institute, is designed to turn waste coal products into high value synthesis gas for use in power and chemical applications. The technology performs this gasification without many of the harmful emissions normally associated with coal fired energy production. SES currently has offices in Houston, Texas, Shanghai and Beijing, China. For more information on SES, visit www.synthesisenergy.com or call (713) 579-0600. A stand-off over a potentially dangerous chemical plant ended Friday in the center of Xiamen after thousands of protesters energized by widespread SMS text messages repeatedly charged police lines and the police backed down, letting the marchers through. Even in China, where authorities spend huge amounts of time and effort to monitor and block Internet traffic, the Xiamen protest illustrates the explosive power of the online and texting community and the inability of authorities to choke it off. By Friday afternoon, the Internet had exploded with photos, videos and live updates on such social websites as Twitter, Flickr, Tudou and countless blogs and forums. The revolution may not be televised, but it will most certainly be blogged. The day's events, however, are also an indication that at least some of China's authorities, faced with thousands of protests daily, have begun to bend to crowds without resorting to the brutal tactics that have characterized so many other incidents across the country. The story started when it was announced last November that a chemical plant was being built just 7 km across Xiamen Bay in neighbouring Haicang海滄District. The plant is expected to involve the manufacture of paraxylene and PTA (terapthalic acid), two toxic substances essential to the polyester industry. The two companies constructing the project, Dragon Aromatics and Xiamen Xianglu Group, received approval from the State Development and Reform Commission and were supposed to have undergone an environmental assessment. That assessment, however, was not made public or even available to the dissenting members of CPPCC. Columnist and blogger Lian Yue of Southern Weekend wrote extensively, trying to bring the issue into the public eye. But as dissent grew, the Xiamen government closed the topic to local press. Bloggers, however, picked up the slack. At Lian Yue’s suggestion, Xiamen citizens started websites such as HaicangPX and antipx.com, while others posted about concerns of cataclysmic effects should there be any accident that would release the thousands of tons of toxins the plant would produce. National news websites such as Sina and Sohu reported on the matter, however, indicating that the national government was either unaware of growing concerns or believed censorship to be unnecessary. Soon stenciled graffiti began appearing across Xiamen, depicting seagulls and the English words “I Love Xiamen, No PX “. The mayor of Xiamen, He Lifeng, claimed that there was no significant problem with the plant and that dissenters such as Zhao Yufen were in error. Meanwhile, it was discovered that Xiamen Xianglu Group was connected to Chen Youhao, a fugitive businessman wanted by the Taiwanese government on breach of trust charges. On March 16, Xiamen University professor Zhao Yufen, a member of the Chinese People’s Political Consultative Conference, gave a speech at the CPPCC meeting expressing concern over the health hazards posed by the plant. Chinese regulations stipulate that such plants should be at least 10 km away from urban areas. That was followed by a joint letter written by 105 CPPCC members urging the project be relocated. Although the Chinese press and the CPPCC official conference reported the complaints, it wasn’t until the issue was picked up by alarmed Xiamen Internet and SMSショートメッセージサービス users that it exploded into real public view. Although a critical article examining the potential environmental dangers from the plant appeared in March in the Hong Kong magazine Phoenix Weekly, the edition was quickly pulled from shelves in Xiamen. However, it was available in other parts of Fujian and the rest of China and Xiamen and quickly picked up by members of the online community. Many news outlets reported the message was sent on March 28, though a similar although not necessarily identical message was definitely first sent on March 25. On the 28th, Yang Jinlin, a host on the Phoenix TV program Du Bao Magazine Critique read and commented on the Phoenix Weekly article, declaring the project “poison “. Phoenix TV is a Mandarin-language station broadcast from Hong Kong but watched widely on the mainland. On May 29, the SMS message was reportedly blocked amid claims it had reached a million people. Blocked words reportedly included “benzene “, “demonstration “, “atomic “, and “leukemia “, but only Xiamen registered numbers were blocked and numbers registered in other areas of the country were reported to work. May 31, Xiamen Daily published an editorial stating that both the government and concerned citizens had Xiamen’s best interest at heart, but that one individual, the SMS writer named XiamenWave22, was “misleading the public and provoking hostility between the government and the masses “. Netizens continued to leave comments voicing their skepticism and anger, but there was little to indicate what might occur the following day. At 8am, people began arriving at the People’s Great Hall across from the Municipal government. Dozens of police lined the front of the government headquarters, and were stationed around the People’s Great Hall. By 8:30am, the crowd had swelled to several hundred. As the numbers grew, yellow ribbons were handed out and people took photos from all angles. The police took no action, and minutes later the crowd cheered as the first sign, an eight-by-11 sheet reading “Oppose PX, Protect Xiamen “, appeared. Then things grew quickly ? red banners on poles, a long purple banner and signs printed on heavy board were raised, and the crowd chanted “Protect Xiamen, Everyone has a Responsibility “. Then at 9am, apparently spontaneously, the crowd began to move. The crowd moved west with the police following them but making little attempt to prevent the march. Eventually the protesters circled back to the south side of the Great People’s Hall where the march had started, encountering police tape blocking them from circling the hall. They turned south and crossed into the heart of the city. 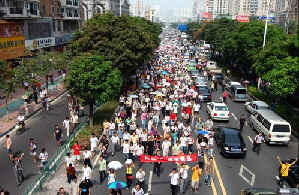 Children, senior citizens, and Xiamen residents of all sorts were among the throng, which some marchers estimated at as many as 5,000. One elderly woman said she had journeyed from northern Fujian “for the sake of Xiamen’s children and grandchildren “, a slogan of the march that came from the infamous SMS message, and was repeated through internet posts and signs held by marchers. Although a recent graduate of Xiamen University labeled the municipal government criminals, the atmosphere was overall one of jubilation. People left shops along the route to watch, cheer and join the march. Faces looked down from office and apartment windows. Crowds gathered on flyovers to look down at the sea of people as they brought traffic in the center of Xiamen to a standstill. The police, perhaps prescient enough to realize that stopping the march would bring even more bad publicity, followed the march and cleared streets ahead of them, diverting traffic to prevent any accidents or injuries. Considering that there had been no national ban on reporting the story, and press in Hong Kong had already taken note of the issue, any crackdown to prevent the protest would probably have simply made the situation worse, or perhaps even sparked a violent conflict. The marchers continued but at one intersection they were met by a line of police with interlocked arms and two trucks of PLA soldiers in green fatigues. To cries of “Charge! “ dozens of marchers led the crowd directly into the line of police, who relented and allowed them to pour through several gaps. The police and military redeployed at another intersection and again the marchers charged through, this time demolishing part of the metal railing that separated east- and west-bound traffic. The marchers made their full circuit back to the municipal government, and by three o’clock that afternoon there were reports of continuing protests. In the following days, attention will be on the Xiamen government to see whether the protest will make government-controlled television or newspapers. The central government, if they were not paying attention now, will be keeping a vigilant eye on Xiamen. Ewing Management Group (EMG) announced today it completed $100M of investments in two Chinese companies in the first half of 2007. One company, based in Hangzhou 杭州, China, is a leading horticulture company in China, applying advanced technologies to the development of a wide range of high-quality plants and flowers. The second company, based in Changzhou 常州, China, is a leading manufacturer of styrene monomer, a chemical used in a broad range of polymer derivatives, ranging from low cost commodity polymers to engineering plastics and synthetic rubber. The company holds a large and growing position in the dynamic horticulture market in China, which consists of woody plants and flowers used in commercial and residential landscaping applications. This company is the largest producer of several varieties of woody plants and flowers in China, and it has been growing at a 46% compound annual growth rate over the past four years. The company utilizes an innovative system of plant breeding and fast propagation technologies, including hybrid, mutation, inducing and cloning methods. It operates several advanced R&D centers and production centers throughout China. The chemical company, currently producing 200,000 metric tons of styrene monomer, is the first producer in China funded by private capital and is strategically located in Jiangsu Province, a region where approximately 60% of all domestic consumption of styrene monomer occurs due to the booming industrial manufacturing base. The styrene monomer market in China is growing rapidly and is being satisfied primarily through imports. The company enjoys a competitive cost advantage over importing countries primarily by virtue of lower product logistics costs and the far lower cost of process equipment in China relative to elsewhere in the world. This has the effect of improving the economic attractiveness on all new-build projects. There are a number of possible expansion projects being studied that can add value to the site within a reasonably short time frame. Douglas G. Nyhoff, President & CEO of EMG, said: "We are very excited about our first two investments in China. Both companies possess tremendous strengths and significant growth potential. This is an exciting opportunity to combine these companies' strengths with EMG's long track record of financial and operational success, and for us to provide the capital to ignite growth. We will assist the Chinese management teams in financing and executing a strategy of rapid, sustainable growth." Nyhoff added: "The primary focus for EMG going forward is Asia given the dynamic growth Asian economies are experiencing. We opened an office in Shanghai recently and are excited to be investing $100M in these two very attractive opportunities. EMG brings financial resources, but more importantly, it brings the management and operational expertise needed to assist the companies as they face the challenges of continued rapid growth. The investment by EMG, and its management know-how, will support Chinese management teams as they create jobs for China and secure a leading position in their segments of the dynamic Chinese economy. We look forward to a long and fruitful partnership with the management teams of all our investments. To support further investments in the region, we will be raising a dedicated Asia fund later this year." Based in Dallas, Texas, with an office in Shanghai, China, Ewing Management Group is focused on acquiring and managing companies in manufacturing or asset-intensive industries. Armed with $1 billion in capital, a new Dallas buyout firm that's one of the state's biggest is on the hunt for poorly performing companies in manufacturing and other asset-intensive industries that it can turn around. Ewing Management Group was formed in July after ending its affiliation with the Carlyle Group, a prominent and sometimes-secretive private equity firm based in Washington, D.C. What is now Ewing Management was then called Carlyle Management Group. Carlyle Management also bought out and turned around poorly performing companies in manufacturing and other asset-intensive fields. The Carlyle Management Group raised a $590 million fund in 2002, but invested only about $118 million of that in two companies. The fund, which had a two-year investment period, was dissolved, and what is now Ewing Management purchased the stakes it did not already own in the current incarnations of both firms: a Northville, Mich.-based maker of plastic components for autos called Key Plastics L.L.C., and Sterling Heights, Mich.-based Key Safety Systems, a manufacturer of automotive safety components and systems. B. Edward Ewing, a turnaround specialist who is Ewing Management's chairman and chief executive, also has those roles at both Key Plastics and Key Safety Systems, and will continue to do so. The two firms are part of an umbrella organization in Farmington Hills, Mich., called Key Automotive Group. In addition to getting two portfolio companies in the spinout, Ewing also brought over its roughly 23-person staff of investment professionals. Carlyle and Ewing Management have repeatedly said they closed the $590 million fund because they decided jointly not to extend its two-year investment window, and that the split was amicable. Published accounts have said the fund wasn't finding investment opportunities fast enough, though Carlyle has denied that. The new fund has a five-year window. Despite its relatively young age, Ewing Management has been busy so far. It has established a New York office and plans to open one in Shanghai, China, next year. And, while officials decline to discuss deals they're currently working on, published reports say Ewing Management's August bid to buy a British school-bus maker, Henlys, for up to $150 million, was unsuccessful. Wooing of Henlys began during the Carlyle Management Group days, the reports say. On its face, severing the Carlyle affiliation might have seemed a risky move. Carlyle has tight connections in the upper levels of business and government. Among those affiliated with the firm in some capacity are Lou Gerstner, former chief executive of IBM; former Defense Secretary Frank Carlucci; Arthur Levitt, a former chairman of the Securities and Exchange Commission; and Thomas "Mack" McLarty, who served as chief of staff in the Clinton administration. Carlyle's portfolio includes three Dallas-area firms: The Dr. Pepper/Seven Up Bottling Group, Aviall Services and Vought Aircraft Industries Inc. But losing the Carlyle connection apparently didn't hamper Ewing Management's fund-raising efforts. A $1 billion fund is large by first-time standards, and is not far removed from the size of the biggest turnaround funds in Texas. A few years ago, Dallas-based Hicks Muse Tate & Furst Inc. raised $1.5 billion for its fifth and latest fund, which focuses on buyouts of U.S. firms. And it is reportedly targeting between $972 million to $1.2 billion in commitments for its second European fund, down from the roughly $1.95 billion it secured for its first European fund. Fort Worth's Texas Pacific Group, meanwhile, closed out its fourth fund at $5.3 billion earlier this year. Ewing Management's management team puts a significant amount of its own money at risk in its fund, which they say gives them an incentive both to choose deals wisely and to keep them focused on improving the operating results of the firms they buy. Ewing Management executives have committed more than $200 million of their own capital for the fund and collectively are the largest investor in the fund -- with Ewing himself the biggest individual investor. The remaining 80% of the fund comes from a combination of institutions and wealthy individuals. The fund will use both equity and debt in doing deals. Sinopec Yangzi Petrochemical Co, a unit of China Petroleum & Chemical Corp (Sinopec), plans to boost its annual paraxylene capacity to 1.2 mln tons in 2010 from 800,000 tons currently, Sinopec Group said in a statement. Yangzi Petrochemical, which is based in Nanjing in eastern China's Jiangsu province, will become China's largest paraxylene (PX) producer after the expansion, it said. It did not disclose the cost of the investment. China's paraxylene demand is being driven by rising consumption of synthetic materials. PetroChina unit Urumqi PetroChemical Co received government approval at the end of last year to invest 3.87 bln yuan on a paraxylene expansion project in the northwestern Xinjiang region. Urumqi PetroChemical expects its paraxylene capacity to increase to 1 mln tons from the current 80,000 tons after the expansion is completed by the end of 2008. China's Zhejiang Hualian Sunshine Petrochemical is looking to raise its purified terephthalic acid capacity to 4 million mt/year by constructing a new two million mt/year PTA plant at its Shaoxing complex by the end of 2010, a company source said Friday morning. Sunshine currently operates three PTA plant in Shaoxing, Zhejiang province. The company's No 1 PTA plant can produce 700,000 mt/year of PTA, while its No 2 and No 3 PTA plants each have a nameplate capacity of 650,000 mt/year. Sunshine is currently in the midst of obtaining approval from the Chinese government for its new plant, but the source was unsure how many lines it would have installed, the source explained in Mandarin. "We might have two PTA lines, each with a capacity of 1 million mt/year. However, other options are also being considered, such as adding more lines with smaller capacities," the source said. Output from the new PTA plant is expected to be sold entirely on the domestic market. Once Sunshine's new PTA plant is on-stream, the company will overtake China's Zhejiang Yisheng Petrochemical as the country's largest PTA producer. Yisheng is slated to become China's PTA producer by end-2008 when its new 1.5 million mt/year Dalian PTA plant enters service. US private investment firm Ewing Management Group has named China's Do How Chemical as the styrene monomer firm it had acquired in May, a Do How Chemical company source said Wednesday. During the acquisition, Ewing Management Group purchased a 80% controlling stake in Do How Chemical, with the remaining 20% held by Chinese investors. The company's name will not be changed, the source said. Do How Chemical owns a 210,000 mt/year SM plant at Changzhou. That plant is currently being expanded with the addition of a new 200,000 mt/year line. Construction is scheduled for completion by the end of 2008. Ewing Management Group has invested approximately $100 million into Do How Chemical's development and future expansion plans, the source said. The Dallas-based Ewing group specializes in buying and managing companies in manufacturing or asset-intensive industries. Its purchase of Do How Chemical is one of its first major investments in China. Beijing: Sinopec Group will delay the startup of a $1.2 billion refinery in east China by at least nine months, adding uncertainties to a joint-venture and oil supply deal with Saudi Arabia, industry sources told Reuters. Sinopec, parent of Asia's top refiner Sinopec Corp, aimed to start the 200,000 barrels per day (bpd) refinery in the coastal city of Qingdao around September 2008 or later, they said, versus the firm's original target of the end of this year. A Sinopec Corp official at the secretariat for the Board of Directors said yesterday the refinery would be delayed slightly, but declined to elaborate. The Chinese energy giant has yet to finalise a deal for state-run Saudi Aramco to take a stake in the project, or how much crude the world's top oil exporter will sell to the plant. "It's not certain now - the deal with the Saudis," said one source familiar with the situation. Officials at Saudi Aramco's Beijing office were not immediately available for comment. The deferment is expected to put a damper on China's hefty crude oil imports - growing at 11.2 per cent in the first half of 2007 from a year ago - as the world's second-largest oil user plans to raise its refining capacity by some 10 percent in 2008. One reason for the delay, the source said, was that Sinopec's new chairman, Su Shulin, wants to ensure the project meets tighter environmental standards as it is situated near the sailing site for the Olympics next August. A second source, who put the delay to end-2008, linked the move to the sudden resignation in June of former chairman Chen Tonghai, an industry veteran Chinese media said was under investigation for alleged graft. By September 2008, it would mean a stretch of more than 39 months since construction began at Qingdao, in Shandong province, in June 2005. The current stage of construction was not immediately known. It took the Chinese firm only 22 months to complete a similar-sized refinery in the southern island of Hainan. China is set to add about 710,000 bpd of crude refining capacity next year, some 10 per cent of the country's total fuel consumption, which will boost crude imports to fresh highs and help cut back refined fuels imports. China now imports nearly half its crude requirements. Aug. 14, 2007　The Shaw Group Inc. The Shaw Group Inc. announced today that its Energy & Chemicals Group has been awarded contracts to provide its proprietary technology, engineering and procurement services for two 800,000 metric tons per year grassroots ethylene plants in China. The value of Shaw's contracts, which will be reflected in its fourth quarter fiscal year 2007 backlog, was not disclosed. The first plant, for PetroChina Fushun Petrochemical Company, will be located in Fushun, Liaoning Province. The second plant, for PetroChina Sichuan Petrochemical Company, will be located in Pengzhou, Sichuan Province. The contracts cover basic engineering, technology licensing, procurement of key equipment and materials, technical training, commissioning and start-up services. "Shaw has worked closely with China's olefins producers to license its technology and help source more than three million tons of ethylene production capacity in China during the past 30 years," said J.M. Bernhard Jr., chairman, president and chief executive officer of Shaw. "Today, we are pleased to be selected by our long-time client, PetroChina, for these significant new projects." Shaw's ethylene plants possess a global reputation for high operational reliability, rapid start-up and superior performance. Providing technology, design, engineering and/or construction to more than 120 plants, Shaw is an established leader in ethylene technology. Since 1990, Shaw technology has been selected for 35 percent of the world's ethylene capacity increases. The Shaw Group Inc. is a leading global provider of technology, engineering, procurement, construction, maintenance, fabrication, manufacturing, consulting, remediation and facilities management services for government and private sector clients in the energy, chemical, environmental, infrastructure and emergency response markets. A Fortune 500 company with nearly $5 billion in annual revenues, Shaw is headquartered in Baton Rouge, Louisiana, and employs approximately 25,000 people at its offices and operations in North America, South America, Europe, the Middle East and the Asia-Pacific region. For further information, please visit Shaw's Web site at www.shawgrp.com. The Shaw Group Inc. announced today that its Energy & Chemicals Group has been awarded a contract to provide technology and basic engineering for a 500,000 metric tons per annum ethylbenzene/styrene monomer (EB/SM) plant in Tianjin, China, for Tianjin Dagu Chemical Industry Co. Ltd.
天津LG大沽化工　Tianjin LG Dagu Chemical Co., Ltd. The plant will be located in Tianjin Industrial Park, Lingang Industry Area, near the city of Tianjin. Shaw will also provide procurement services for critical equipment in addition to training and technical advisory services during plant construction and start-up. The value of Shaw's technology and engineering contract, which will be included in the company's fourth quarter backlog, is approximately $50 million. The new plant will utilize proprietary EBMax(SM) and styrene technologies provided by Badger Licensing, LLC, a joint venture of affiliates of The Shaw Group Inc. and ExxonMobil Chemical Company. "We are pleased that we were selected for this project, which is the largest ethylbenzene/styrene monomer project undertaken by Shaw in China," said J.M. Bernhard Jr., chairman, president and chief executive officer of Shaw. "China's chemical industry is growing rapidly, and we look forward to successfully demonstrating Shaw's ability to offer world class proprietary technologies and services to our customers." The Hebei Development and Reform Commission has signed a contract with Sinopec to build a petrochemical refinery base in the Caofeidian area 曹妃甸 of Tangshan 唐山 City in Hebei Province, which has put similar plans by the China National Petroleum Corp. in limbo, state media reported yesterday. The base will feature an oil refinery with an annual processing capacity of 10 million tons and an ethylene processing base with an annual processing capacity of 1 million tons, according to the Economic Observer. Construction activities can start once the base receives the necessary approvals from the National Development and Reform Commission, an official from the Hebei Development and Reform Commission, who wished to remain anonymous, told Interfax. Although the official declined to explain why the province has decided to cooperate with Sinopec over the project, it is clear that the new base will hinder the CNPC's plan to develop a similar base in Caofeidian. In May this year, China Business News quoted a CNPC official as saying that the company plans to build a large oil refinery base in Caofeidian, an area close to the company's recently discovered Nanbao Oilfield. "If CNPC gets approval for its project in Caofeidian, it will be easy for the company to process oil from its Nanbao field," Han Xiaoping, the chief executive officer of the energy industry Web site China5e.com, told Interfax. However, Han said that it is unlikely that both bases will be approved by the NDRC as two such similar developments in the one area would be a "waste of resources". Both Sinopec and CNPC wish to incorporate crude oil reserve and import capabilities as well as oil processing and petrochemical operations in their bases. "The advantage of CNPC's project is that it is near the company's Nanbao Oilfield, and this could result in reduced transportation costs," Han said. CNPC also operates two other large oilfields in Hebei Province, namely the Huabei Oilfield and Dagang Oilfield. As Qi Fang, the chairman of Hebei Chamber of Commerce for Petroleum Industry, told the Economic Observer recently though, Sinopec has better refining capabilities than CNPC, and that these capabilities could be used to process oil from the Nanbao Oilfield as well as oil imported from the oil-rich Bohai Bay. Sinopec's Oil Import Wharf project in Caofeidian, which was given the go-ahead by the NDRC in November last year, will feature a 300,000-ton crude-oil-tanker berth that is capable of handling 20 million tons of crude oil a year. The wharf will also be connected to a crude oil pipeline linked to the Tianjin Municipality with an annual transmission capacity of 20 million tons. On the other hand, CNPC has only built an LNG wharf in Caofeidian with an annual LNG supply capacity of 6 million tons. Hebei Province has been pushing in recent years to have Caofeidian involved in the second phase of the country's national strategic oil reserve program. When contacted by Interfax, an official from Hebei Development and Reform Commission said only that the province was "making great efforts" to compete to have strategic oil reserve bases located in the region, and that it will work with a strong but unnamed partner in its lobbying efforts. 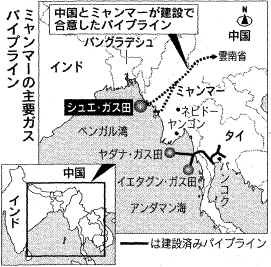 The country initiated the first phase of strategic oil reserve base construction in 2003. The first phase involves the construction of four strategic oil bases in locations on the country's east coast, namely Dalian in Liaoning Province, Huangdao in Shandong Province and Zhenhai and Zhoushan in Zhejiang Province. China's Shanghai Coking has delayed the startup of its new 450,000 mt/year methanol plant in Wujin to the first quarter of 2008, a source close to the company confirmed Friday. The company had initially hoped to start up the plant at the end of 2007. However, test runs are now scheduled for early 2008, and on-specification output is not expected until later in the first quarter. The plant is currently under construction at the same complex where Shanghai Coking operates a 350,000 mt/year methanol plant. Shanghai Coking's methanol is produced from coal-gas, but its technology allows it to produce export-grade purity output. Typically, methanol produced in China from coal gas contains relatively high levels of impurities which make it unattractive to potential overseas consumers. Earlier, Shanghai Coking had hoped to triple its methanol exports to around 150,000 mt/year when the new plant comes on stream, but exports have become a less attractive option recently due to a cut in export rebates by the Chinese government that went into effect July 1. Prior to July, 13 percentage points of the 17% VAT on methanol were rebated when the methanol was exported. However, that figure has been reduced this to just 5%.